New for 2019 – Finish line will move down into Riverside Park for better racer and spectator experience. The rest of the course will be the same as in 2016 and 2017. See maps below. 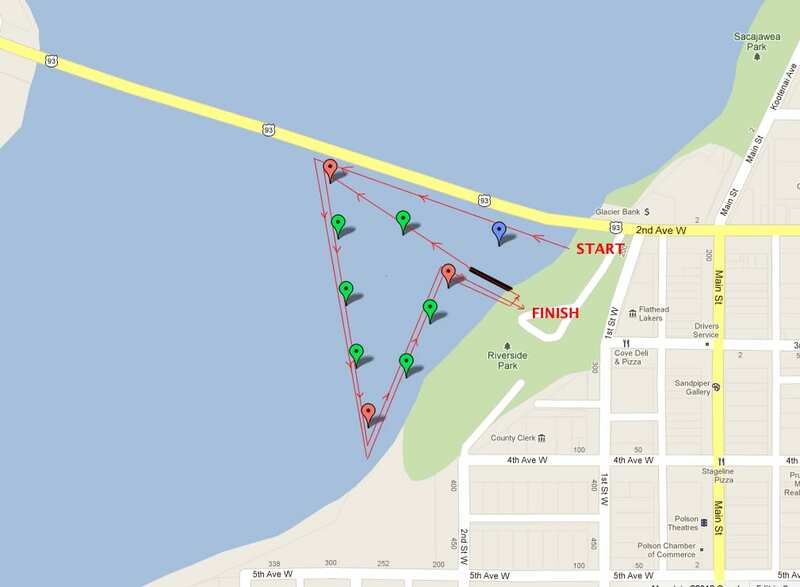 (updated 8/5) The swim course will consist of two laps around a 750-meter counter-clockwise triangle with a short dock run and jump in between. It will start at the edge of the swim area in Riverside Park and head west along the south side of the bridge for approximately 150 meters. Next it will cut back to the southeast and head diagonally 315 meters across the river and back to the shore at the south end of the park, before turning north for 255 meters along the shore and then east for the last 30 meters to exit up the Riverside boat ramp. By mid-August the river current should be minimal so as not to significantly impair swimming speed or direction. Special Features – This course will provide a unique opportunity for spectators as they can watch the start and entire swim from the pedestrian walkway on the bridge. They will also enjoy the chance to watch swimmers exit midway and run along the dock before plunging back in for the second lap. The bike course will leave the back side of Riverside Park on the new bike path, head south for 3 blocks on 2nd St. W., turn right on 6th Ave., left on 6th St., and then right on 7th Ave. as it passes the Kerr Dam playfields, curves 90 degrees to the south, and heads up the hill out of town. After a two mile climb, the course will go straight through the Kerr Dam intersection on continue for another half mile, turning right onto Forman Road (new for 2013). Forman Rd. initially bends south, but then turns again to head straight west down a long gradual hill to intersect with Valley View Rd. at the about 7 miles. Riders will negotiate three 90 degree corners on Valley View before heading straight south again. At about 9 miles, the route turns left onto Eli Gap Rd. at the four way Valley View School intersection. The next 5 miles follow Eli Gap east toward the mountains and finish with a steep climb up to the intersection with Back Rd. Riders will turn right (south) on Back Rd. and go approximately 3 miles before making a 180 degree turnaround. The final leg is 8 miles heading north on Back Rd. and back down the hill into town. The bike course will return to Riverside Park following the same streets used on the way out of town. Another way to summarize the bike course is that the first half is exciting and technical with two significant climbs and some tight corners and rough pavement, while the second half is flat and fast on smooth road, with a big decent back down into town. Signs will be posted at 10k, 20k, and 30k with arrows at all the turns and marshalls at the key intersections and turnaround. Special Features – The Valley View loop boasts a great combination of low traffic roads and gorgeous views of the Mission Mountains that should provide a nice distraction from the challenging hills and cycling toil. Racers will particularly enjoy some fast and fun corners, and a panoramic view of Flathead Lake as they recover on the fast descent back into town. Note: There will be no aid stations on the bike course so plan to provide for all of your own nutrition and hydration needs. Click the link below to view the new bike course. The run course will be a clockwise loop, flat and uphill for the first 4.5 miles and then mostly downhill and flat for the last 1.5. 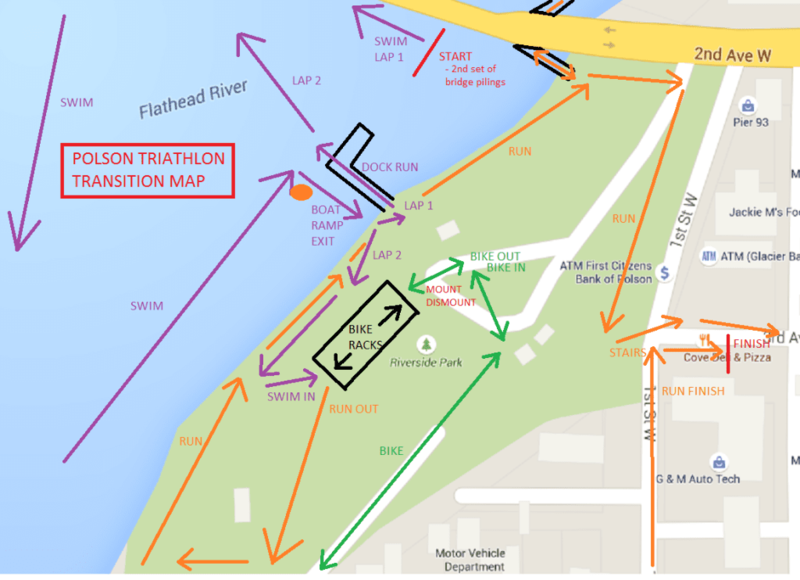 It starts by heading out the back of the transition area, along the lake shoreline under the bridge, through Sacajawea Park and around Salish Point. Just before the boat ramp, it turns right up a short gravel hill, across the top of the hill, and then hard right onto a paved, S-bend downhill back to the waters edge, returning to the waterfront path through Sacajawea Park. At about the 1-mile mark, runners will again pass under the bridge and through Riverside Park before climbing the stairs out of the park and continuing east through downtown Polson on 3rd Ave. Runners will follow 3rd Ave. east, turn right on 5th St., and head south over a combination of pavement and gravel roads to turn left on 10th Ave and straight across 7th St. and right on 8th St (south). The route gradually climbs for six blocks on 8th St. and then turns right on 16th Ave (heading west). The next segment is fairly level as it follows 16th Ave. to jog left on 1st St. E. and then right again on 17th Ave. ending at the 3.5-mile mark as it turns left to start up the hill on 2nd St. W. The road turns right to become 19th Ave. and then left into the big hill on 6th St. W. and right over the top on Grenier Ln. At the bottom of the steep hill, runners will turn right onto Kerr Dam Rd. and take the pedestrian/bike path heading north and gently downhill toward the lake. After the road wraps around to become 7th Ave., runners will turn left, heading north on 6th St. Then it will turn right on 6th Ave., left on 2nd St. W., right on 4th St., left on 1st St. W., and then right on 3rd St. to finish in front of the Cove Deli above the park. We will have mile markers just before each aid station and all corners marked with cones and paint, plus course marshalls at the key intersections. Aid stations will have water, HEED, and ice. Special Features – Runners will get a chance to see some of the quite back streets of Polson. The course will consist of mostly paved surfaces with a few short segments on dirt and grass for variety. Community groups will provide five themed and enthusiastic aid stations, approximately one per mile. The highlight of the course will likely be the long, wonderful downhill stretch and incredible lake view along Kerr Dam Rd. as the run course parallels the bike course back towards town.